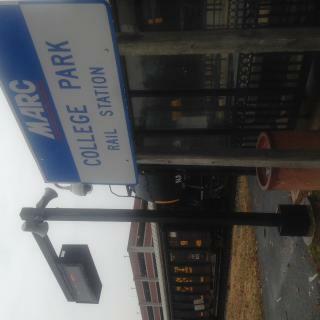 This is the College Park MARC (Maryland Rail Commuter) Rail Station, a stop on the Camden Line which connects the Washington D.C. and Baltimore areas. There is a nearby parking garage, and the site is walking/bike accessible. By offering commuter rates, this rail encourages a more sustainable alternative to personal transportation. When commuters choose to take this rail over driving a personal vehicle, they are benefiting the environment by reducing their carbon footprint due to automobile travel. Look online on the Maryland Transit Authority website to find out if the MARC system can help make your commute more sustainable.